If you are a chia seed lover like me, I have a feeling you will be a big fan of today’s giveaway! 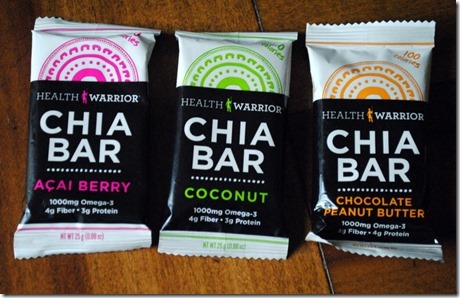 Early this week, the folks at Health Warrior sent me a small sampling of their chia bars. 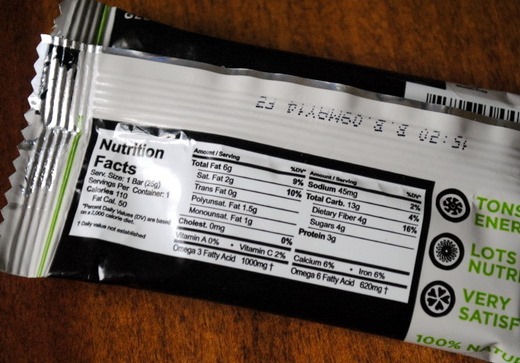 I was excited to try them because now that I am working at the gym, I am always on the lookout for convenient, healthy snacks that I can eat on the go. 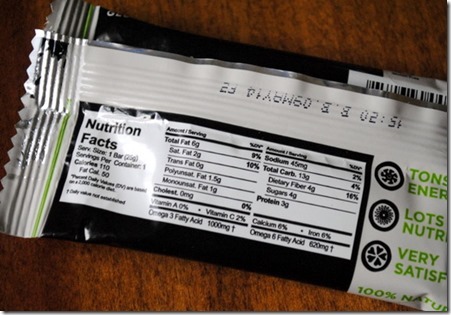 As I blogged about on Monday, I am trying my best to make healthy snacking decisions rather than grabbing whatever unhealthy fare can be found in the break room, and these bars are small, portable and make the perfect snack for me to enjoy right before I teach a group exercise class. I want something that will give me energy without weighing me down and the Health Warrior Chia Bars totally fit the bill! They are chewy, slightly sweet and very tasty. I’ve already ordered a large pack of the coconut flavor off Amazon! The coconut is definitely my favorite! 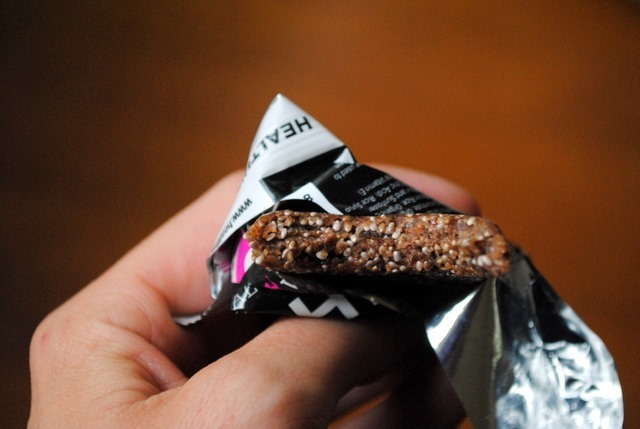 The bars also come in chocolate peanut butter and acai berry. Yum! 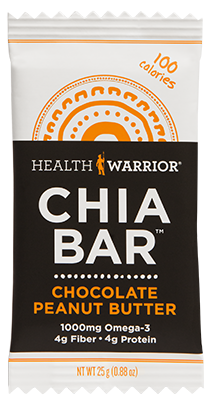 Health Warrior Chia Bars are all-natural, vegan, low in sugar, dairy- and soy-free and clock in at around 100 calories each, with 1000 mg Omega 3’s and four grams of fiber. You can also find out more about them on Facebook and Twitter. And now here’s your chance to win a sample of your own! 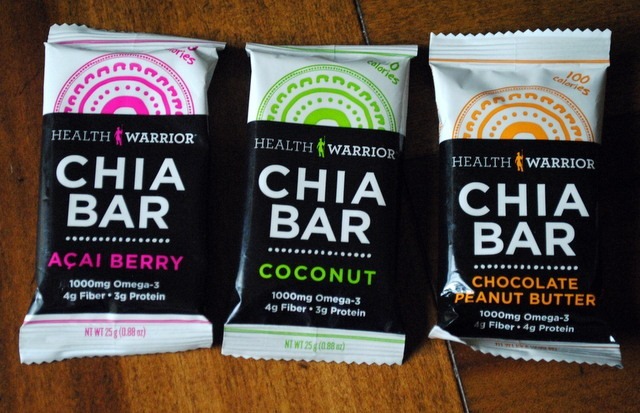 Five PBF readers will win a prize pack from Health Warrior Chia Bars. To enter this giveaway, simply comment below, telling me which flavor you’re most excited to try: Chocolate peanut butter, coconut or acai berry. Disclaimer: This is a sponsored post and giveaway, though all opinions expressed are my own. Yay chia! Chocolate peanut butter sounds great! Definitely the chocolate peanut butter!! The chocolate peanut butter looks good! chocolate peanut butter for sure! I would love to try the peanut butter and chocolate bar!!! I really want to try the chocolate peanut butter one! these look so good! i would love to try! Chocolate peanut butter all the way! I would love to try the coconut!!! I love anything chocolate peanut butter. YUM! I want to win!!! Yum! 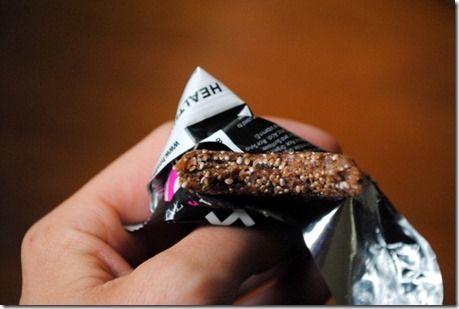 Anything Chocolate Peanutbutter, healthy, & around 100 calories HAS to be tried! Chocolate peanut butter for sure! I’ve actually (gasp!) never tried chia seeds before but have really wanted to! The choco pb sounds delish, and i bet it would satisfy my afternoon sweet tooth! 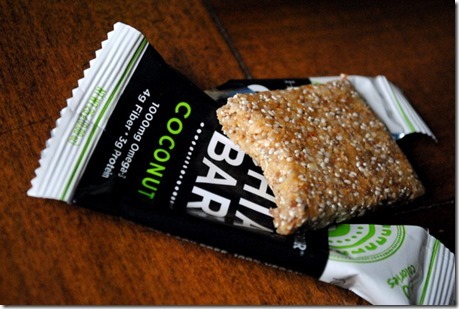 I’ve just recently taken a liking to coconut so I’d like to try those first! Thanks for the chance to win! Yum! I can never say no to peanut butter but the coconut sounds delicious as well! Oooh chocolate pb of course! I love chia seeds too! Peanut butter chocolate is at the top of my list! chocolate peanut butter sounds yummy! Chocolate peanut butter…love that combo! Coconut for sure, although chocolate peanut butter does not sound too shabby either haha! Mmmmm- coconut is my fave! I just discovered your blog and love it! I would love to try to coconut! Chocolate peanut butter sounds great.